Add all ingredients through the mushrooms to a 6 quart pressure cooker. Stir all ingredients, then layer the tomatoes but do not stir. Seal the pressure cooker and bring it up to high pressure. Reduce heat to maintain pressure (unless using an electric pressure cooker, like the Instant Pot). Stir in parsley, lemon juice, and sumac (if using). To add a nutrient boost to this soup, ladle over raw greens, such as kale or spinach (rinsed and torn into bite-sized pieces). The heat from the soup will cook the greens perfectly! 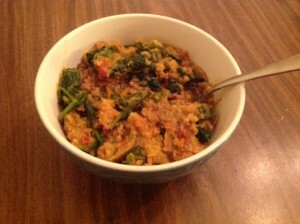 Enjoy with cooked millet or oat groats for a heartier meal. Another great tip from my friend, Chef AJ (EatUnprocessed.com): If you like this soup and want to keep it in your regular rotation, use some old empty spice jars and fill several of them at a time with all of the spices that go into this soup (except the parsley and sumac, which are stirred in at the end). Label the jars so that the next time you make this soup, you can just grab one and use it without having to measure out the individual spices. This works for all recipes and is a real time saver!